Team Stryker - MISSION 003: PAGE 12 “SO THAT’S HOW WE’RE PLAYING IT?! MISSION 003: PAGE 12 “SO THAT’S HOW WE’RE PLAYING IT?! Its Team Stryker time! Today’s page is what happens when I let Deadeye off his leash. Deadeye has done 100 tours of Vietnam (even after the conflict was over) and in that time he has become quite an efficient killing machine. There isn’t a deadly creature on this earth that he hasn’t fought, beaten and eaten. Drawing Deadeye fight is always a highlight for me due to how primal he is. From an early age Deadeye has learned to survive on his own and will do anything to make sure that he is the victor in any battle he comes across. 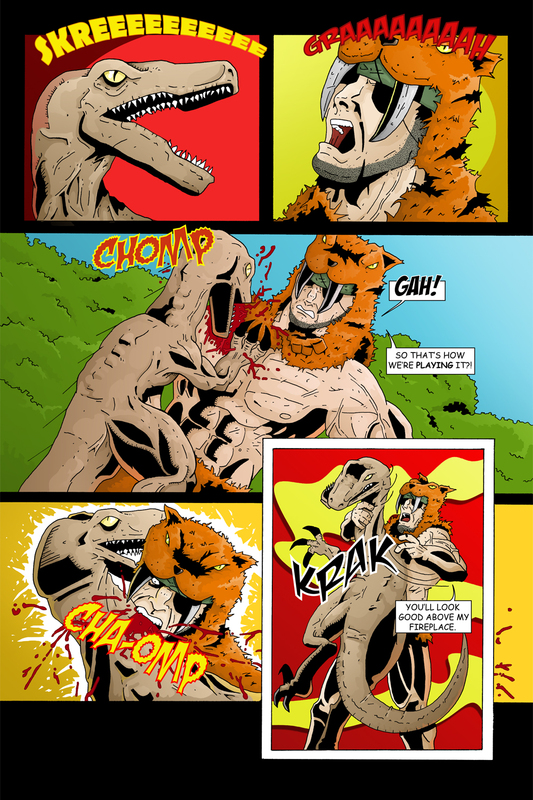 When thinking about Deadeye’s fighting style against a velociraptor I have to think how would two raptors fight? Deadeye fights off his instincts and that means he will adapt to any situation. If a raptor bites him, he will bite back. Deadeye is a survivor and when you are battling your way through the Jurassic era there is no one else I’d want watching my back. For those of you that don’t follow Team Stryker on Twitter or Facebook (shame on you!) I recently sat down with the lovely Ari Carr and did an interview about Team Stryker and the struggles of trying to make a webcomic a success. You can read the interview here. It was a fantastic experience and hopefully I’ll get the chance to do another as we get closer to the launch of Team Stryker Mission 004 in 2013. Have a great rest of the week and I’ll see you all back here for the newest page of Team Stryker!